This Leyland Leopard L2 with Harrington Cavalier C32F body was new to Ribble in 1961. 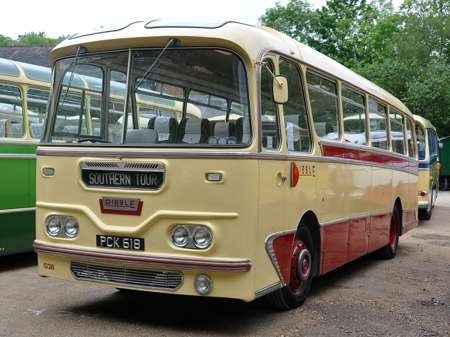 The low seating capacity means it was one of the touring fleet. I do have a query about the chassis designation, because some of my sources mention a twin-speed rear axle, meaning it would be L2T. Any thoughts, please, folks? 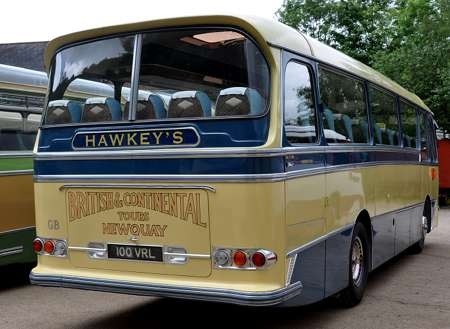 The coach is seen at the Harrington event at Amberley on 3 June 2012. Here we have an interior view of the vehicle which was taken courtesy of the owner. 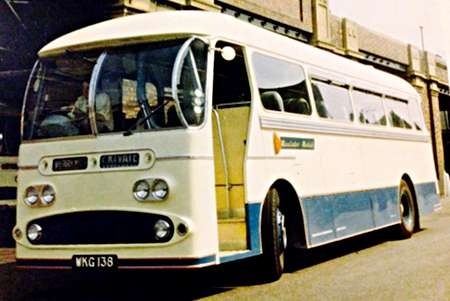 Primrose Valley Coaches of Filey had PCK 616. I enjoyed driving it and its two speed axle, and only 32 luxury seats. 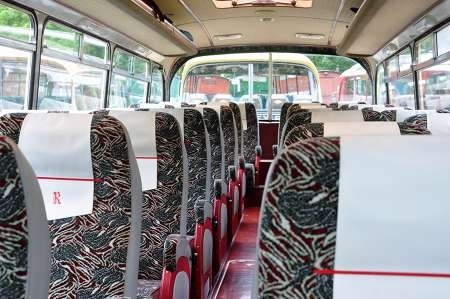 I became misty eyed looking at this photo as an avid admirer of Harrington’s Cavalier and Grenadier designs and there is a tantalising glimpse of one of Southdown’s near identical extended tour Leopards alongside, these were definitely L2Ts.The main differences were the 27 reclining seats in 2+1 layout and the glazed cove panels and they too were a delight to drive although I only drove them after they were up seated for normal coach duties. My drooling at least won’t show on an e-mail. Thank you, Dave and Ken, for confirming the L2T version. 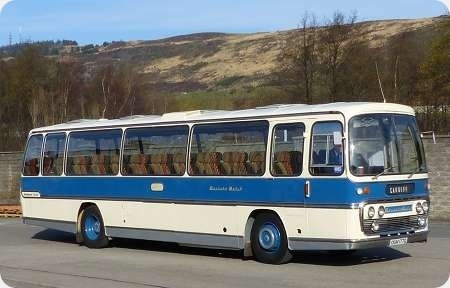 Dave, the adjacent Southdown was 2722 CD and the blue and cream one parked back-to-back with PCK 618 was Hawkey’s 100 VRL. I have views of both, if you’d like me to forward via Peter. PMT acquired three of this batch in 1972 as Roadliner replacements, PCK601, 602 and 605. These were C41F as acquired. They did four seasons with PMT before withdrawal in 1976. I remember them as very sound, reliable coaches. Does anyone have photos of them in PMT service? Pete, Like Diesel Dave I tend to glaze over and dribble when a Harrington appears . . they truly are icons of an age when these machines shouted style and quality, sadly missed. 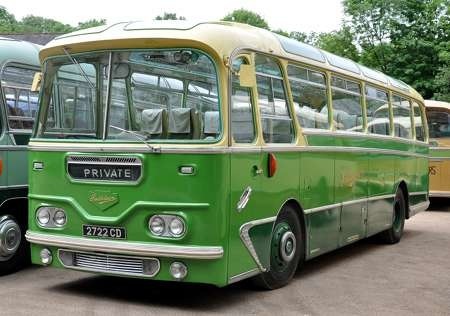 I for one would appreciate a peek at your shots of 2722 CD and 100 VRL. Nigel Edwards comments that he would like to see views of 2722 CD and 100 VRL. These photos only reinforce my long-held view that Harrington’s Cavalier/Grenadier bodies seemed to look stylish in virtually ANY livery! 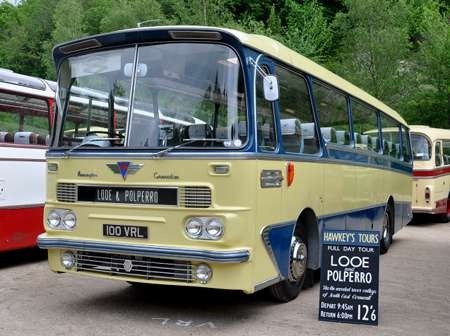 Many thanks to Pete Davies for posting the three extra photos of 2722 CD and 100 VRL as looking at them made me all misty eyed and nostalgic and quite weak at the knees. 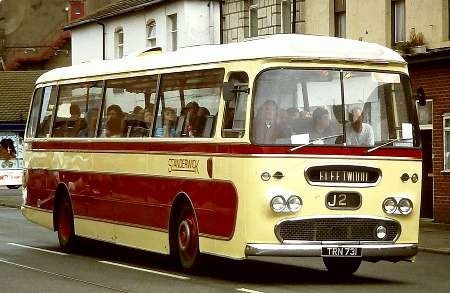 It is also good to see 2722 CD in the original livery with the cream roof unfortunately this only lasted 2 or 3 years before being painted green this was long before it was reseated as it is now. The armchair reclining seats from these and the later 1800-44 Leopard PSU3’s were distributed to the various staff canteens and rest rooms for the benefit of drivers numb parts and were much appreciated.